Big beach house with plenty of room for everyone. Game room with pool table. Welcome to the Sand Castle! This expansive home is the ideal get-away for large families. In 2013, we did an $80,000 remodel on the interior and exterior! On the main (2nd) floor is a living-dining-cooking area, and two master suites with private baths. The kitchen has granite counters, stainless appliances and a breakfast bar which can seat 4. The dining area has seating for 8. The living area has a tv, stereo, wet bar and plenty of room for everyone. Outside, you will find a huge deck, which greatly expands the entertaining areas. The 3rd floor features two queen bedrooms and a loft. The loft has a day bed and trundle overlooking the living area. The loft opens onto a wonderful deck with panoramic ocean views! In addition to the baths listed above, we have two outdoor showers that are perfect for rinsing off after a delightful day on the beach! The expansive deck has plenty of furniture for lounging, sunning, and book reading. At the bottom of the dune walkover is a large built-in sitting area for enjoying the direct views of the beach. Guests at Sand Castle have the opportunity to enjoy all of the amenities of the nearby Serenata Beach Club for a nominal fee. These privileges include: 3 sparkling pools (1 heated), exercise facilities, great dining room, structured activities for children, and much more! You can visit the Serenata Beach Club website for more info. CLICK ON THE LINKS BELOW TO SEE OUR OTHER PROPERTIES AND TO SEE A VIDEO TOUR OF SAND CASTLE! Everything you need to enjoy the beach. Very nice decor. We loved staying here! It was spacious- plenty of room for us all. It was well stocked with towels, chairs, bedding, and beach toys and we were pleased with the extra refrigerator in the garage. The fireplace was a total bonus. We will be back!! Thank you for staying with us at Sand Castle. We are very glad that you had a great time. The home owner has done a great job making sure the house offers everything our guests could need at the house. We look forward to having you back again soon! We had a great time, the house was beautiful. Very spacious and directly on the water. We really enjoyed ourselves! We had a wonderful time at the Sand Castle. The house was able to sleep all 15 of us, plenty of towels and beach towels. We cooked all of our meals there, only minor problems with adequate cookware. The problem in the kitchen was the water leaking under the sink, it has been happening for some time. . The door stop on the deck did not have the rubber piece on it, was a hazard to my feed. The beach access steps were a challange for my husband and I. We are in our 70's. I understand the storm did the damage, but a better replacement is needed. Everyone loved the house and voted to have it again next year. I need to know that better beach access has been built before I book it again. The house and furniture were great. Need minor repairs to be made. Once again Wren Beach Rentals came through with a wonderful home to spend a long weekend with my family. 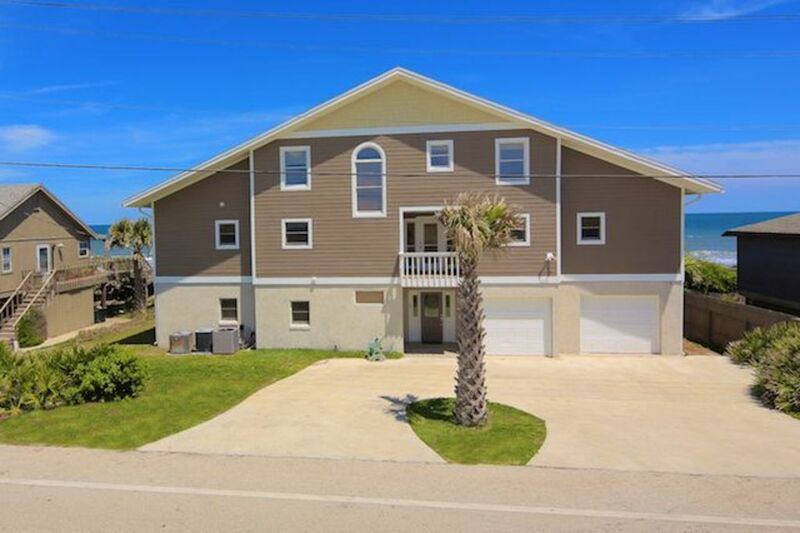 The Sandcastle property is a beautiful home with all the amenities we were looking for. Every year we try to get away for a long weekend in January with my brothers and sister and their spouses (6 couples) in the Ponte Vedra area. We desire to spend as much quality time together as we can so we stay in and prepare all our meals at the house. Sandcastle is very well supplied with all kitchen utensils and plenty of seating for meals with our big group. We enjoyed spending hours on the back deck fellowshipping while looking at the beautiful ocean (even saw a whale pass by one day several times). The property was very clean and well-maintained just like it looks on the website. The only negative was that we had six couples and it really is a five bedroom house plus a loft with two twins. It was not very private for the couple in the loft but we are a close family so it wasn't that big of a deal. Overall it was great and I would definitely recommend it to friends. Thank you for your review. Sand Castle is a very nice, big beach house. It is advertised as a 5 bedroom with a loft. If there is a group of 6 couples that want complete privacy, it would probably be a good idea to find a 6 bedroom house. That said, Sand Castle does offer plenty of space to spread out and mingle. The Sand Castle fit our group of 16 comfortably. We stayed for a week and wished it could have been for longer. The house is very close to the beach and the view is outstanding! We woke to the sunrise over the ocean the first morning. The house feels very new and is tastefully furnished. Half our group dined in during our stay and found the kitchen well stocked with useful cookware. The grill and spare fridge and freezer came in handy too. Publix grocery store, less than 5 minutes down the road, was a huge convenience. Not a day was missed spent on the relatively private beach. We all had a blast boogie boarding the waves. The garage was full of a good collection of beach toys and boards. It was a little tight parking 5 cars, so we certainly made use of the 2 car garage. In the evening, we would sit on the deck and enjoy the breeze or play a game of billiards. Hopefully we can make it back next year. Many thanks to David Lombana for all of his accommodations. We are so glad that you had a great time. "Sand Castle" is a very well appointed, and large house. We do our best to make sure it has everything you need for a great stay. We look forward to having you back again soon! Sand Castle is located in South Ponte Vedra, 4 miles from historic St. Augustine and 20 miles from posh Ponte Vedra. We have several public golf courses within a 20 minute drive, and St, Augustine offers many different activities. Stroll the quaint shops on St. George Street or explore the antique shops and art galleries scattered throughout town. Tour the town by trolley or horse and buggy; don't miss the Alligator Farm, Ghost Tours, Lightner Museum, Fort Matanzas, and the many historical attractions! If you love water sports, you have come to the right place! You can rent surf boards, jet skis, canoes, and other boats; you can go para sailing, hot air ballooning or fishing in the ocean or the Intracoastal Waterway! In Ponte Vedra and Jacksonville, you can go horse back riding on the beach, take surfing lessons, visit the great Jacksonville Zoo, or take in a Jaguars game! We have something for everyone--but most guests love our beach house the most! You may never want to leave! For rentals of one week or less, a $500 deposit is required upon reservation. For rentals of 2 weeks or more, the deposit $500/week. The cleaning fee for all rentals is $250. A $50 processing fee is required for each rental. 10.5% tax applies to all rents and fees. Weekly rates only for all holidays; $500 up-charge for Easter, Memorial Day, July 4th, Thanksgiving, Christmas, and New Years weeks. All fees due 8 weeks in advance of arrival date.